The objective of this study was to evaluate the occurrence of anti-Leptospira spp. antibodies in female buffalo in the state of Pernambuco. A total of 123 female buffalo blood samples were collected from five properties distributed in the state of Pernambuco. The microscopic agglutination test was used to study anti-Leptospira spp. antibodies. The occurrence of anti-Leptospira spp. antibodies was 28.5% (35/123; CI 20.7–37.3%) and on different properties, the occurrence ranged from 28.6% to 80.0%, with 100% of the properties showing animals with positive results. The serovars of the serogroup Sejroe with a higher incidence were Hardjoprajtino (CTG strain, 49.1%) and Hardjo (Prajtino genotype, 43.2%), followed by serogroup Grippotyphosa with the Grippotyphosa serovar (3.9%), serogroup Pomona with the Pomona serovar (1.9%), and the Icterohaemorrhagiae serovar Copenhageni (1.9%). This was the first record of the occurrence of anti-Lepstospira spp. antibodies in female buffalo in the state of Pernambuco. Control measures are necessary to prevent health and economic losses, given that the agent involved affects animal reproduction, triggering drops in conception rates or even clinical cases of abortion. In Brazil, many studies on the prevalence of different Leptospira spp. serovars in buffalo have been conducted, permitting an understanding of the disease's epidemiology, which reflects the ecological relationship between humans and chronically infected mammalian reservoirs.6 In the state of São Paulo, Vasconcellos et al.7 isolated Leptospira santarosai from buffalo of Vale do Ribeira, whereas Favero et al.8 found 43.7% positives in 879 serum samples with a higher frequency of the serovars Hardjo (43.3%) and Wolffi (32.5%). In the state of Pará, Silva et al.,9 researching agglutinins of anti-Leptospira, verified a 67.7% positivity rate in 127 analyzed serum samples, of which 15.7% were reactive to serovar Hardjo. Viana et al.,10 in the state of Amazonas, obtained 80.0% positives (164/205) with a higher frequency of serogroup Autumnalis variant autumnalis and serogroup Sejroe and varieties Hardjo and Wolffi. Observing the lack of data on this disease in the northeast region of the country and the economic losses related to leptospirosis in buffalo, the objective of this study was to determine the occurrence of anti-Leptospira spp. antibodies in buffalo originating from herds in the state of Pernambuco, Brazil. 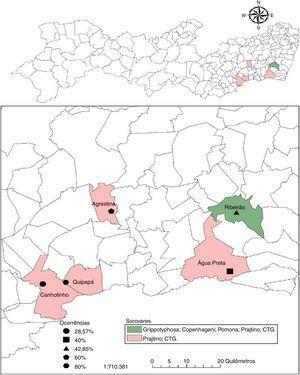 A transversal study design was carried out through convenience sampling, not probabilities, in five counties distributed in the state of Pernambuco, Brazil. The properties were chosen for convenience, including the counties of Quipapá (5 animals), Ribeirão (42 animals), Canhotinho (21 animals), Agrestina (5 animals), and ÁguaPreta (50 animals). In total, 123 blood samples were collected from female buffalo of reproductive age, with or without a history of reproductive problems, raised on a semi-intensive or extensive regimen, and with no history of vaccination for leptospirosis. Blood samples were obtained by venipuncture of the coccygeal vein using Vacutainer® disposable 25×0.8mm needles and sterilized 5-mL Vacutainer® tubes. Afterward, the samples were packed into isothermal boxes containing recyclable ice and forwarded to the laboratory where they were centrifuged at 900×g for 10min. After this procedure, the samples were filled in polypropylene tubes, properly identified, and stored in a freezer at −20°C until processing. For the study of anti-Leptospira spp. antibodies, the microscopic agglutination test (MAT) was used. Samples considered positive were those with titrations equal to or higher than 100.12 When coagglutinations occurred between different serovars with the same titration, both serovars were considered reactive, and in cases of different titrations, the serovar with the higher titration prevailed. Titrations of the seropositive samples were carried out by employing a dilution of 1:100 to 1:3200,13 employing the serogroups for herbivores, available at the Serviço de Diagnóstico de Zoonoses (SDZ) UNESP Botucatu – São Paulo (Table 1). Relation of serogroups, serovars, and strain of Leptospira spp. utilized in the Serviço de Diagnóstico de Zoonoses (SDZ), UNESP Botucatu – São Paulo, 2016. The location of the properties was obtained with the help of a Global Positioning System. For mapping, the georeferenced data were entered in TerraView 3.1.3 software. Descriptive statistical analysis was carried out to calculate the relative and absolute frequencies of the results obtained in the serological test. Fisher's exact test was used to identify associations between abortion history and the serological examination. This involved univariate analysis of the variables of interest. Epi Info, version 3.5.1 software was used (CDC). The occurrence of anti-Leptospira spp. antibodies was verified in 28.5% (35/123; CI 20.7–37.3%) of the samples analyzed in Pernambuco. When the occurrence of antibodies in buffalo on different properties was analyzed, a range of 29.0–80.0% was observed with at least one positive animal perserovar. The geographical distribution of positive buffalo is shown in Fig. 1 and Table 2. Distribution and occurrence of anti-Leptospira spp. in buffaloes of the state of Pernambuco, Brazil. Occurrence of anti-Leptospira spp. according to serogroups in buffaloes distributed by municipalities of the state of Pernambuco. n, total of samples analyzed; F.A., absolute frequency; F.R., relative frequency. L. interrogans sv Hardjo (genoype Prajtino). L. interrogans sv Hardjo (strain CTG). Among the positive samples, 14 (40.0%) reacted to more than serovar. The serovars of serogroup Sejroe with higher occurrences were Hardjo (strain CTG – 49.1%) and Hardjo (genotype Prajtino – 43.2%), followed by serogroup Grippotyphosa with the serovar Grippotyphosa (3.9%), serogroup Pomona (1.9%), and Icterohaemorrhagiae serovar Copenhageni (1.9%) (Table 3). These serovars showed titrations varying from 100 to 800 (Table 4). Occurrence of serogroup by use of the microscopic agglutination test in female buffalo of the state of Pernambuco. Distribution of serovars of Leptospira spp. by titles in buffaloes of the state of Pernambuco, Brazil. No significant difference was observed for the variable history of abortion (p=0.405) associated with MAT; however, a higher occurrence of 31% of seropositive animals was observed in the properties with a history of abortion. This is the first study of serological reaction by Leptospira serogroup Sejroe (CTG and Prajtino) in female buffalo in the state of Pernambuco, Brazil. Results are similar to those found for the occurrence of anti-Leptospira spp. antibodies in buffalo formerly reported in the country by Brasil et al.14 in Paraíba with 27.9% of seropositive animals; however, some serogroups found by those authors were distinct from the ones observed in this study, for example Bratislava (11.0%) and Canicola (5.9%). Silva et al.9(p543) investigated the occurrence of anti-Leptospira spp. antibodies in buffalo in the state of Pará and identified 67.7% of animals as seropositive, highlighting serovar Hardjo genotype Prajtino, showing the importance of this serovar to the species. Despite the low occurrence of the serogroup Grippotyphosa serovar Grippotyphosa, the latter presented a reagent sample with an 800 titer. According to OIE,12 the occurrence of any serovar with titers between 100 and 200 may indicate infection or vaccine antibody residue, however higher titers may disease and/or the emergence of a carrier that can eliminate the agent in the urine in the stage of leptospiruria that contaminates the environment, acting as a source of infection for other animals and humans. It is noteworthy that the animals sampled in this study had no history of vaccination and therefore the high titration indicates recent infection, and the positive animals are considered sources of infection. This study found a higher occurrence of serogroup Sejroe with serovar Hardjo (Prajtino and CTG). The strain CTG was isolated for the first time in samples from cattle in Brazil by Moreira,19 being typified in the Royal Tropical Institute, Amsterdã, Holanda. Since 1991, many studies in Brazil have highlighted the importance of serogroup Sejroe in bovine leptospirosis, including the serovar of this serogroup in the antigen panel18(p242). According to those authors, a high prevalence of infection has been demonstrated in the herd (75%) and individuals (44.2%) with a predominance of serovars of the serogroup Sejroe (80.3%). Infection in buffalo by this serogroup may be associated with their proximity to bovines, because on 80.0% (4/5) of the properties studied, bovines were present. The elevated occurrences of seropositive female buffalo for serogroup Sejroe serovar Hardjo (CTG and Prajtino) showed the importance of that species in the epidemiology for leptospirosis involving those serovars, because these animals may act as carriers and contribute to environmental contamination through urine elimination, acting in this way as a source of infection of other animals and humans2(p601). The presence of seropositive animals may assure the persistence of this serogroup in the herds,3(p311) besides causing an economic impact, generating reproductive disturbances as well as hemolytic cases6(p217). Like bovines, buffalo suffer abortions associated with infection by Leptospira spp.6(p215). It is known that serovars of the serogroup Sejroe, the Hardjo and its strains and genotypes are described as causes of abortion in that species.20 Regarding the abortion history, no significant association was observed in this study. However, it was verified that the property with a history of miscarriages (20%, 1/5) presented buffaloes infected the different serogroups (Grippotyphosa; Icterohaemorraghiae; Pomona; Sejroe) which may indicate the participation of Leptospira spp. as agent responsible for reproductive disorders in this herd. In the literature, there are few seroepidemiological studies in buffalo. Therefore, it is necessary to execute other studies by using isolation and molecular techniques to investigate the importance of this serogroup as a cause of abortion in buffalo. Pinto et al.18(245) reinforce the necessity of studies in different countries and a greater standardization of the diagnosis of Leptospira spp. infection. This is the first record of the occurrence of anti-Leptospira-specific antibodies against the serogroup Sejroe, serovar Hardjo (CTG and Prajtino) in buffalo in the state of Pernambuco, Brazil. Control measures are necessary to prevent sanitary and economical losses, because the agent involved affects animal reproduction and poses hazards to public health. OIE. World organisation for animal health. Leptospirosis. Chapter 2.1.9.2008. htlm: http://www.oie.int/fileadmin/home/eng/health_standards/tahm/2.01.09_LEPTO.pdf Accessed 19.01.17. Moreira EC. Avaliac¸ão de métodos para erradicac¸ão de leptospiroses em bovinos 1994. 94f. Tese (Doutorado em Medicina Veterinária) – Escola de Veterinária, Universidade Federal de Minas Gerais, Belo Horizonte.